In Himmerland lies on of the largest raised bogs in Northern Europe called Lille Vildmose. Earlier it had a size of 15 km2 but the northern part is today cultivated or the peat has been removed for use in improvement of garden soil. The history of Lille Vildmose takes its beginning for about 6000 years ago. In these times the area was a shallow bay with a vegetation of large salt swamps. As the northern parts of Denmark are slowly rising since the Last Ice Age, the area became isolated from the sea and the water turned more and more fresh. In the deposits in the bottom of the raised bog one can see, that the vegetation then was a mix of freshwater swamp and fen with some lime-loving plant species. Later the peat layer became so thick that the influence of the alkaline ground water became smaller and more acidic rainwater had more and more effect on the vegetation. This favoured the Sphagnum-mosses (bog-mosses) and a raised bog was created. The peat has today grown around 6 m. above the firm ground and the bog recieves all of its water and nutrients only from rain water. These harsh conditions are only tolerated by a small number of special adapted plant species and the vegetation is unique. The (allmost) untouched southern part of Lille Vildmose covers today an area of 3 x 8 km. The bog is raised above the surrounding land, so when one stands in the middle of the bog it is impossible to see the trees at its borders. 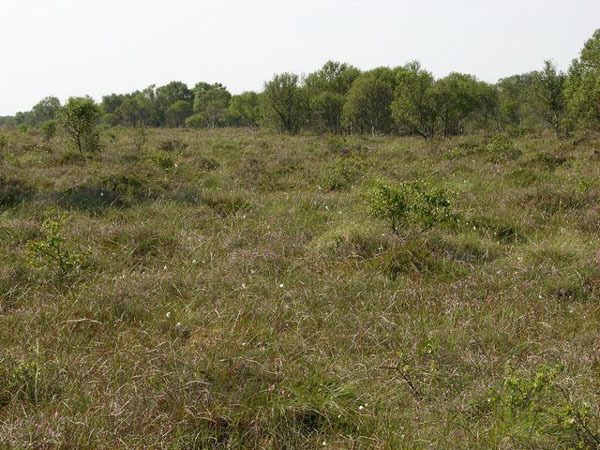 The picture shows the characteristic variation between hillocks and dips on the surface of the bog. The untouched part of Lille Vildmose is surrounded by a fence. Incide the fence there are deer and wild-boars living as wild. Also the birdlife is unique. At a lake in the bog a lot of ducks etc. can be seen and the golden eagle has just started to breed in the area.